Russian Defence Minister Anatoly Serdyukov is to arrive in Delhi next week as the head of a high-level delegation of government and industry officials to pave the way for the deals. The Indian Express daily informs that it is expected that India also will buy an additional 30 carrier-borne Mig-29K (Fulcrum-D) fighters, as provided by the 2004 contract. Lately India has been upset by a delay in Russia's maintenance of the Admiral Gorshkov cruiser and its reconstruction from a vertical takeoff platform into a classic aircraft carrier. A package of contracts on reconstructing and delivering Admiral Gorshkov to India, costing $US 1.5 billion, was signed by state-run arms exporter ‘Rosoboronexport’ and the Indian Navy in January 2004. 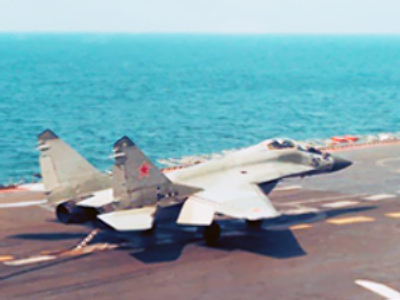 It covers modernising the ship and equipping it with up-to-date weaponry, including sixteen MiG-29 aircraft. Twelve single-seat MiG-29Ks and four two-seat MiG-29KUBs, to be deployed on Admiral Gorshkov, are currently being constructed in Russia for the Indian Navy. Also, there is an option in the contract to supply an additional 30 fighter jets by 2015. India is eager to get Admiral Gorshkov as soon as possible, as the cruiser is to replace its Navy’s flagship INS Viraat aircraft carrier – although still operational, it is outmoded, as commissioned in 1959. When the works started it turned out that the assigned $US 750 million were not enough to carry out Admiral Gorshkov’s maintenance and modernisation. Russia is not ready to negotiate with India about more funds for the Admiral Gorshkov aircraft carrier contract yet, Director General of ‘Rostekhnologii’ state corporation, Sergey Chemezov, told journalists this Wednesday. 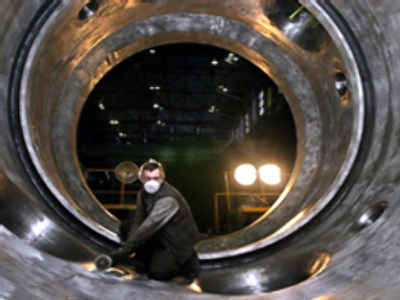 According to the Russian experts’ estimation, an additional $US 1 billion is needed to fulfill the contract. And even if financial issues are settled, the aircraft carrier will be commissioned only in 2011-2012, while earlier it was supposed to happen in 2008. India is one of the biggest buyers of Russian arms. According to estimates, 70 per cent of Indian arms are Soviet- or Russian-made. Russian MIGs have been India’s main fighting aircraft for decades, though since the mid-90s the Indian military prefer Sukhoi’s production. In 1996 Sukhoi has signed a contract to deliver 8 Su-30K and 4 Su-30MKI fighter jets. The second deal has been for purchasing 10 Su-30Ks, the third – for producing 140 Su-30MKIs under licence and the fourth one, concluded in March 2007, – for purchasing 40 Su-30MKIs. In 2007 an agreement on co-operation in the area of a joint development of a fifth-generation fighter jet, Sukhoi T-90 PAK FA, has been also signed. This aircraft is characterised with the highest maneuverability, supersonic cruising speed, long range and outstanding defence properties. The project cost has been estimated at $US 10 billion. India is also purchasing and producing under licence Russia’s T-90 tanks.